Succulent plants are trendy for a reason. With juicy leaves, stems, or roots, succulents form a vast and diverse group of plants, offering easy-care choices for your home. Plus, they look stunning planted alone or as companions. The color variation of succulents seems almost endless: blue-green, chartreuse, pink, red, yellow, white, burgundy, almost black, variegated, and more. The leaves may be rounded, needlelike, berrylike, ruffled, or spiky. Many have an enticing "touch-me" quality. Light Most varieties need at least half a day to a full day of sunlight. In extremely hot areas some afternoon shade is recommended. Planting Remove plants from their pots and plant making sure the soil level remains the same depth on the plant. Once established, your succulents will benefit from a layer of pebbles or pea gravel spread on the soil around the plant. This is also very decorative. Soil Succulents need good draining soil. When planting in the garden, make sure the area drains well and is not in a low spot that would stay wet. For container planting you can purchase cactus soil or incorporate sand, gravel or volcanic rock for better drainage. The container you are planting in should have a drainage hole or put crushed rock on the bottom before your planting medium. Watering After planting, water in well and allow the soil to dry slightly between waterings. Succulents don't like to have wet feet. When you do water, water thoroughly. Uses The planting possibilities using succulents are endless. The different colors, textures and habits make the most interesting containers and troughs. Succulents make beautiful rock garden plants. With a wide variety of bloom times there is always something with color. 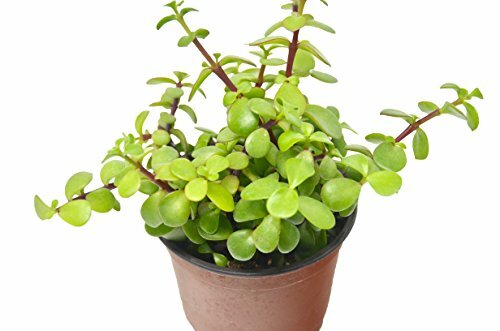 INCLUDES: 1 'Elephant Bush' Succulent in 4" pot with a FREE care guide. UNIQUE PLANT: Succulents will arrive in 4" pots fully rooted in soil. Plants may vary slightly from the pictures. WELL PACKED: All succulents are carefully packed for shipment and will arrive in great condition and ready to enjoy. CARE GUIDE: A care guide will be included with all orders to help you properly care for your plants. FAST SHIPPING: Succulents are expedited to make sure they arrive healthy and in a timely manner. If you have any questions about this product by House Plant Shop, contact us by completing and submitting the form below. If you are looking for a specif part number, please include it with your message.